If you have an individual trash collection account; in good status– START HERE! If your trash collection bill is paid through an apartment complex or property management company – START HERE! Option 1: Drop off your large items or electronic waste for FREE! They are open Monday – Friday 8:00 a.m. to 5:00 p.m. Check in at front office and be prepared to provide address and show I.D. Option 2: Schedule a pick up at least 48 hours before regular collection day. This service is available up to four times per year, and includes up to three items per pick-up. Once scheduled, place your items at the curb no earlier than 7:00 p.m. the evening before your scheduled pick-up day. Option 2: Contact your Property Manager to schedule a pick up at least 48 hours before regular collection day. This service is available up to four times per year, and includes up to three items per pick-up. Unacceptable bulky items – Household hazardous waste (paint, oil, batteries, etc. ), construction debris (concrete, bricks, cement, etc.) spas, pianos, camper shells, and any items requiring more than two persons to safely handle. 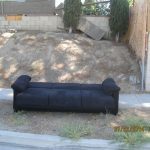 Illegal dumping damages neighborhoods, ruins the beautiful views of Santa Clarita, threatens the environment, and it’s against the law. If you witness illegal dumping or locate items that have been illegally abandoned in the City right of ways, you can report it online through our Resident Service Center. The storm drain system is in place to quickly move rain water from the streets to the river in order to prevent flooding. Improper disposal of paint, motor oil, cleaners, and other contaminants will pollute our river and may affect local groundwater. To report illegal dumping and discharges to the storm drain system, call the City’s Stormwater Hotline immediately at (661) 222-7222.